always accompanied by fantastic hospitality and friendly, welcoming hosts. KARLSTAD, ON THE northern shore of lake Vänern, is not just a residential town, an university town or a diocese – it is now also my town. A walkable, liveable and very loveable place where there is always something happening. It’s not surprising that the city’s emblem is a happy sun. ”The Sun in Karlstad” – as the ever cheerful inn owner Eva Lisa Holtz, whose statue stands next to the city hotel, was known – is something Värmland locals take very seriously. Värmland welcomes everyone! hese lines describe Värmland in a fantastic way. Our part of Sweden is filled with all this; but also, infinitely more! There’s the hospitality, cultural treasures, as well as the unique tradition of storytelling which is brought to life by both Västanå Teater and Wermland Opera. The magical forests that give us opportunities for recreation, contemplation and exercise. The miles and miles of lakes that are ideal for swimming and bathing, spending time on the shore, or just splashing your feet in the water at the edge of the shore. Our rivers give us the opportunity to go on adventures like rafting, canoeing, and kayaking. 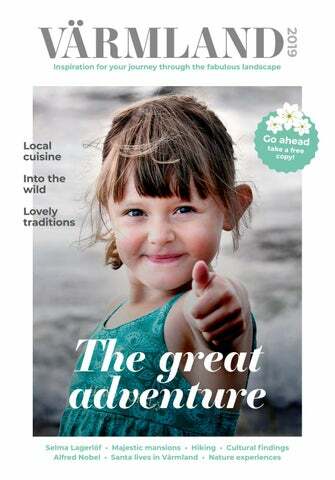 SO NOW I’D LIKE to welcome you to join us on journey and be inspired by this year’s magazine. Contact: info@visitvarmland.se Web: visitvarmland.se Facebook: @visitvarmland Instagram: @visitvarmland While every care is taken to avoid mistakes, the publisher cannot accept liability for any errors, misprints, or programme changes. Feel free to quote us, but credit us where due. Editorial Värmland 2019 is produced by Glory Days AB for Visit Värmland. find breathtaking nature with deep forests, clear lakes and rivers, hills with spectacular views, and valleys with traditional farming landscapes. Sunne is well known for its wealth of nature and culture. Creative souls have always felt a pull towards this region – authors and artists, musicians and composers, stage actors and directors. Together, they have contributed to the cultural riches and the tradition of storytelling that set Sunne apart. The most famous of them all is author and Nobel Prize winner Selma Lagerlöf. She is best known for her story about the Wonderful Adventures of Nils. The book was originally written as a geography school book, but it soon gained praise and admiration far beyond Swedish school children. Selma Lagerlöf was born and raised at Mårbacka mansion just outside of Sunne. Her home is now a museum that offers guided tours, and her beautiful garden is open for visitors. Activities in the wilderness Everyone can benefit from learning how to survive in the wildness. Nordmarkens Canoe Center, just south of Årjäng, offers several exciting courses for all levels of ability. The Center offers trips for young people, families and businesses. Choose from shorter, day trips or weeklong courses where you, for example, learn how to make a fire and live according to nature. Skate culture Yes, it´s actually a great idea to bring your skateboard on your Värmland holiday. At Vildaparken i Väse, there is a 750 square meter skatepark, a mountain bike trail and obstacle course – right out in the middle of the forest. In Karlstad, there is a skateboard and BMX arena at Tingvallahallarna and Forshaga has its very own concrete park for skaters in town centre. Visit visitvarmland.se for even more suggestions for fantastic activities and trips on offer in the region. Family adventures Idyllically situated next to lake Rådasjön is Rådastrands Camping, a family paradise. You can choose to explore the area by canoe or mountain bike, challenge your fellow-travellers to a climb, a game of laser tag or even create your very own “Iron Man” challenge. Head out on an animal safari in the surrounding wilderness. Or just savour a relaxing bath and fish in the lake or close-by river Klarälven. Stay overnight or for a longer period of time in Kristinehamn to discover great nature. Find peace and quiet in our small town where you can choose between rooms in historical buildings, modern hotels, campsites, farm houses or cabins right by the water. Over summer, tour boats will take you to islands in the region’s unique archipelago. In wintertime you may want to go ice-skating or jig fishing. Stay for a few days and let us help you find memorable places in our part of the world. Lake Vänern is the third largest lake in Europe and a magnificent inland sea with breathtaking views of the horizon. It was created when the ice melted 10 000 years ago. Due to its size Vänern offers an environment similar to the sea but with the benefits of sweet water lakes. Smooth rocks, islands, beaches, shallow bays, clean water and protected wildlife areas. There are over 20 000 islands and islets. Reach a few of them when hiring your own boat. Or go on a chartered trip, a pirate adventure or regular tour boats. Get on or off at our guest marina near the town centre or at Vålösundsbryggan by the inlet to Kristinehamn. Stroll along the water on the walkway and stop for a rest at a café, a playground or park area. Hiking Discover nature on our quality marked trails. You can hike along the water, follow the historical Iron Trail or wander in open landscapes and spot moose, sea eagles and other rare animals. Enjoy the silence, the rich flora and fauna, the colours and edible treats in our forests. Welcome to Kristinehamn! Kristinehamn Tourist Office Tel: +46 550 881 87 E-post: turist@kristinehamn.se #visitkristinehamn www.visitkristinehamn.se/en 9. MANY OF THE properties have once housed well-known Swedes; such as Alfred Nobel’s Björkborn in Karlskoga, Selma Lagerlöf ’s Mårbacka in Östra Ämtervik, Gustaf Fröding’s Alster in Karlstad and Erik Gustaf Geijer’s birthplace in Ransäter. The beautiful buildings are often framed by splendid gardens, beautiful fruit trees and magnificent paths and driveways. This all combines to ensure a visit will come as a welcome relief, providing rest and relaxation for stressed city souls. It is difficult to imagine a more idyllic place for a julbord – a 10.
ll across Värmland magnificent, majestic mansion houses tower across the landscape. These often heritage buildings are beautifully situated amidst peaceful, dazzling surroundings. Country manor house have traditionally always had a strong foothold in Värmland. A visit to one of these manor houses is like an historical journey back to the time of patrons and nobility. The country estates are genuine pieces of Swedish history, some stretching back hundreds of years. Today there are, in total, around 30 manor houses in Värmland, scattered across the county like small glades amidst the dense, enchanted forest. Swedish Christmas Table – or a romantic weekend together with someone special. Or if you are planning on getting married, your wedding day can be made even more unforgettable by hosting the ceremony and wedding celebrations in one of the manor houses. The forests and landscape would be ideal guests alongside the wedding party. “Top notch”, as everyone is saying these days. Beautiful Hennickehammar’s manor house in Filipstad is wonderful whether it is for a festive celebration, conference or a relaxing weekend. The beautiful buildings are often framed by splendid gardens, beautiful fruit trees and magnificent paths and driveways. 12. SOME OF THE manor houses help preserve the Swedish cultural heritage they contain, serving as museums. Others have a more modern approach, offering a combination of accommodation, spa, conference facilities and outstanding cuisine. The manor houses also serve as a perfect starting point to explore the local surroundings and many activities on offer. Go right out into the forest and explore the many other treasures waiting to be discovered. Embrace mansion life at Ulvsby Herrgård Ulvsby herrgård is situated on the slope down toward the western shore of lake Fryken, just a few kilometres north of Sunne. Here you will be very close to cultural as well as natural experiences. Stay the night and take the opportunity to enjoy excellent food and drink. Welcome – we will do everything to make you feel at home! Great weather and not a ripple to be seen on Lake Femunden, the Norwegian lake which forms the start of the Trysilelva and KlarĂ¤lven rivers. such as Linnea and Niclas. Over the years, ou might remember the both had been on long trips, whether on couple from Visit Värmfoot or skis; however, a canoe and kayak trip land’s Instagram account was something totally new. They had the last summer. Linnea Nilssonbasics down, but needed to take a course on Waara and Niclas Bentzer learning different swimming techniques and from Skellefteå together, along with their how to read the water. dog Storm, paddled down river Klarälven on their journey to Gothenburg and the When it came to packing, it was all about intelligent packing; avoiding unnecessary North Sea. A 31-day trip that started at lake weight, and having what it takes to stay Käringsjön in Härjedalen and ended 805 warm and dry. kilometres away in Långedrag. – I remember one of my first mountain – The idea for the trip was born in 2016 trips when we packed nearly 50 kilos in when I read Nordens längsta vattendrag our bags. Among other things, it included [The longest waterways in the Nordic region] I was very inspired, but I had to think long a book about Kungsleden, which was unnecessary. You can just photograph it and and hard before suggesting the idea to Linnea. She jumped at it so have it on your mobile, says Linnea. we decided to start the trip 2 things about... the week after Midsummer in Niclas continues: ...fishing? Not as much 2018, says Niclas. – I think we did well. The as we had hoped... We only thing we were missing was were often too tired in a self-supporting tent, which A YEAR OF planning follothe evening. wed after they had made the would have been good when we ...fear? The biggest decision to go. And a year crossed lake Vänern and had to worry was when we overnight on barren islands. of paddling! Preparing for a were going to cross lake month-long journey puts a lot Vänern. You’re much THE COUPLE COULD not of demands on you, even for more affected by the those who have a genuine intehave chosen a better summer weather, and the risk of rest in nature and outdoor life for their adventure. All the drowning is greater. Campsite at RendalssĂ¸len, the 1,700 meter Norwegian mountain. For the beginner Learn about paddling, life-saving, and equipment. Do some research and go on guided tours. Check the weather reports, particularly if you’re planning on paddling across open water. Drink a lot. Take food that is light, full of energy and is easy to prepare. Stay Safe. Wear a life-vest. Don’t go alone. It’s more fun and much safer with a companion. the mountain terrain, it felt quite nice to be in more civilised terrain. The lovely people who followed our trip online gave us lots of tips and ideas about places, restaurants and attractions to visit along the way. THE SUMMER’S LOW water and numerous sandbanks made the journey somewhat longer than planned as they had to stick to the deeper, outer edges of the river. But it wasn’t anything that spoilt things for the couple, who as a result got to spend more time enjoying the surroundings and nature. Beavers, moose, deer and jumping fish crossed their path during the journey south. – In lake Vänern, it was awesome see a ferret swimming past us! And a frog that jumped down into Niclas’ kayak and tickled his legs before finding a new home on an island out in the beautiful archipelago, laughs Linnea. e meet Mattias Dröschmeister at the bustling food market Smaka på Värmland (Taste Värmland) in Kristinehamn. In the next tent the Baking Festival is in full swing. – The Baking Festival is a concept my colleague Gustav and I came up with. It’s an energy kick to meet like-minded people and bake together, says Mattias. THE DUOS JOURNEY started about five years ago when, over a cup of coffee in Karlstad, they decided to start Artisan Bread at Kasernhöjden in Karlstad. – It was completely by chance, really. I was working in Norway and Gustav was working as a baker in Sweden. Everything came together at once. Within five minutes we were excited at the idea of starting a bakery together. SUCCESS CAME IMMEDIATELY. If it wasn’t enough that Artisan Bread was listed as one of Sweden’s best cafés in White Guide, Gustav Fagerman is now “Baker of the Year 2018”. – Both Gustav and I get restless if we do the same thing for too long. We really think alike and always strive to move forwards, to raise the bar even higher. 22. Lena’s plum chutney, which includes chili among its ingredients, gives a real kick! White fairy tale creatures Maybe you have already heard the tales about them. The white kings and queens of Värmland’s forests. Our white moose is famous all over the world. The magic and ghost-like animal’s all-white appearance is not due to albinism, as one may think. No, these moose obtain this rare feature from a recessive gene that causes the animal to grow white hair with specks of brown. A condition referred to as piebald. Moose experts estimate that there are only just 100 of them in Sweden right now – out of the total population of around 400 000. And many of them live in Värmland. 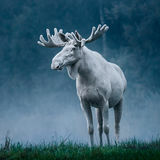 The best chance of glimpsing the unique white moose is in the western part of the county, in the areas surrounding Arvika and Glaskogen. As with all encounters with wildlife, a large measure of patience and respect is recommended. With a little luck, you might be the fortunate one to capture the mythical white animal in a photo. INSTEAD, SELMA WAS schooled at home along with her sisters. Her brothers were sent to school in Filipstad. Her father’s plan that Selma should remain at Mårbacka went against her own wishes. – Throughout her life she is incredibly confident about her talent – that she has something vey unique. At the same time she is scared that she will be forced to live a normal woman’s life, says Anna Nordlund. EVA FRYXELL, one of the early front figures of the women’s movement hears Selma read a poem at a wedding. Fryxell declares that “you must go out into the world; you must get an education.” This results in Selma attending the Royal Advanced Female Teachers’ Seminary in Stockholm. During her studies, Selma builds a network of contacts. With the publication of her debut novel in 1891, The Story of Gösta Berling, Selma is careful not to repeat the mistakes of earlier members of the women’s movement. – She had the ability to be adaptable. Early on, she was conscious that she was moving in two specific circles. Both the women’s movement and around men, the latter demanding a strategy as to how to be accepted. She’s very clever at that, says Anna Nordlund. IN 1909 SHE was awarded the Nobel Prize in Literature and then in 1914 seat number 7 at the Swedish Academy. She then began to make her mark outside literature. – She became Sweden’s first major celebrity. Both the Germans and English talked about her as “The Lagerlöf ”. She was influential, had a network of contacts at governmental level and was the key influencer of her time, says Lena Larson, head guide at Mårbacka. BOTH LENA AND Anna agree that Selma’s most important work was as a writer. – Her first novel, in terms of literature, had an incredible influence on magical realism. But her autobiographical books have also been enormously important in terms of role models for what a woman can achieve. That men aren’t better than us. I think that’s what a lot of the later books are about, says Anna Nordlund. e wake up as the afternoon sun shines through feather-grey curtains in our room at Selma Spa. After a refreshing facial treatment and a nap afterwards, it is time to get some fresh air. Before we came here, we knew there were scenic hiking routes nearby but it was a really nice surprise to discover that Sundberg’s nature area was just a stone’s throw away from the parking lot. Did you know that... ...there is a cycle and hiking route between Storfors and Lungsund? It consists of asphalt, gravel and footbridges. anemones that cover this popular attraction are past their best. On the other hand, the leaves on the trees have started to turn orange and red at the top of the forest canopy. Compared to other nature areas in Värmland, both plant and animal life are particularly evident the countryside around Sundsberg thanks to the calcareous bedrock in the area. For example, seven of the eight species of woodpeckers found in Sweden are to be seen in the region if you are lucky. As the trail grows steeper, our pulses increase, perhaps more than usual given how relaxing 30.
the last twenty-four hours have been. By the time we have reached the top, the sunset is spectacular – yet another chance to take a moment to relax and enjoy the calm. THREE HOURS AFTER leaving the Spa, we are back in our room again. After a delicious culinary experience at dinner in the restaurant, we decided to take a final dip in the jacuzzi. The fresh air from the day’s hike feels like a cool veil wrapping around inside us as we climb into the bubbly water. t Löfbergs Rosteri & Kaffebar in Karlstad, coffee is firmly at the centre of things. Manager Emma Johansson describes it as a tiny “geek café” situated amidst Löfberg’s enormous “coffee skyscraper”. – People are now talking about the character of coffee in the same way you talk about the character of wine. People are more and more interested in coffee’s different qualities and flavours, says Emma. Emma believes that people are increasingly choosing black coffee instead of latte or cappuccino, which was previously more popular. But the most important thing is to have high quality produce and offer fantastic service. Did you know that... ...Löfbergs’ produces the equivalent of over 10 million cups of freshly brewed coffee every day. – When you come into the café, it should feel like you’re visiting our living room. CLOSE TO KLÄSSBOL’S Linneväveri, you’ll find the café, KaffeKvarnen (The Coffee Mill). There’s a selection of ice cream and home-baked goodies prepared in their own bakery – all located in a café that’s built in an old flour mill. And if you are in to ice cream Mormors Glasscafé (Grandmas Ice Cream Café) in Lysvik is the paradise for you. Since 2007, thousands of ice cream lovers have traveled to the small café at the shores of Lake Fryken. Here you can enjoy lots of amazing ice cream creations and flavours with a stunning view over the lake. The Café in Naturum Värmland You’ll find café in Naturum Värmland located in Karlstad’s municipal park, Mariebergsskogen. You can come here to eat the traditional Värmland cake or other delicious cakes and pastries. Alsters Herrgårdscafé Cosy Alsters Herrgårdscafé (Manor-house café) has a selection of home-baked bread, and classic cakes and pastries such as “Frödingtårta”. Several other businesses are to be found here such as an art gallery, manor-shop, handicraft shop and an exhibition about Gustaf Fröding. Café Tant Blå On the second floor in Ulvsby Herrgård is Tant Blå. It’s a tiny, quaint summer café with a stunning view over lake Fryken. You can relax with a good book from the café library, or gather friends and family to feast on a selection of coffee and cakes. Down a flight of stairs they bake cakes and bread with fresh local ingredients. Well, not the coffee of course – that’s from Karlstad. As if taken from a Swedish folk tale. For almost 100 years, a familyrun business from Klässbol near Arvika, has specialised in linen and produced durable and beautiful home textiles. Their work is visible at the Nobel party, embassies as well as the Crown Princess’s home, along with thousands of other homes. Recently, the weaving company developed textiles for the newly renovated and reopened National Museum in Stockholm. Some of these are available to purchase. The applause after the successful musical Something Rotten has just died down but there are already new cultural delicacies to be savoured at Wermland Opera in Karlstad. Up next is the classical opera Carmen, Georges Bizet’s love story about life and death. It premiers May 30, 2019. This autumn it’s time for the comic opera Albert Herring by Benjamin Britten. Alfred Nobel was an inventor, businessman, and founder of the world’s most prestigious prize: The Nobel Prize. We welcome you into his world. lfred Nobel will always be remembered as one of the world’s most successful businessmen and inventors. It was clear that he was a very modern man both from his career and private life. For example, when he moved into Björkborns Herrgård, a manor house in Karlskoga. The manor was included as part of the purchase of the industrial firm AB Bofors-Gullspång. He had ambitious plans and wanted Bofors to be the biggest competitor to British and Germany steel manufacturers. He began by investing just over 2 million kronor, replacing machinery and modernising the company. He also purchased a laboratory and a small hydroelectric power station. ALFRED WAS USED to having running water and electricity, but there wasn’t any to be found at Björkborn. In order to have the kind of home he wanted, he made certain demands from the Board of Bofors. He asked for a billiard table and a comfy bed, even though he rarely slept more than four hours per night. But the most important thing was bookshelves. – Alfred left behind over 2 000 books when he died – all in the original language of publication. We still have his library, says Edith Oldenburg, guide at the Alfred Nobel Björkborn museum. SHE EXPLAINS THAT Alfred loved Värmland and often travelled about the region by horse and carriage. – He had three Russian Orlov stallions when he moved into the estate. He didn’t like it that the carriage made so much noise when traveling on grit roads, so he adapted the carriage wheels and had them covered in rubber. He then added light with the help of steel alkaline batteries on the horses and in the carriage. It’s an excellent example of just how modern he was in his thinking. AT THE TIME of his death, December 10, 1896, Alfred had amassed a fortune of 33 million kronor. Alfred’s loyal and trustworthy colleague Ragnar Solhman, was made executor of his Will together along with Rudolf Lilljeqvist. It was Alfred’s wish that 30 million kronor be used to set up a foundation where 80 percent of the interest would go to Nobel prizes and the remainder would be reinvested. It turned out to be more difficult to do this than expected. The Nobel family went against his wishes and contested the will, wanting his money. The Swedish king at the time, King Oscar II, wanted the prize money to only go to Swedish researchers. But in spite of the strong opposition, Alfred’s final wish respected. Since 1901, the world’s eyes have been focused on Sweden once a year when the prize winners are announced. At home with Alfred At Alfred Nobel’s Björkborn you can see a reconstruction of Alfred Nobel’s last Swedish home. What was once Alfred’s stables is now home to conferences, parties and concerts. The museum offers guided tours all year round. What’s more, the so-called “smart house” attracts children and adults with its range of cool experiments. If you get hungry, there is a museum café. ou don’t become Father Christmas: You are Father Christmas. At least, Inge Olsson in Halla is convinced of this. – It’s a calling, just like the clergy. He, if anyone, should know. After all, he was made an official Father Christmas back in 1995. It is a role he has grown into, keeping pace with his beard which, over the years, has turned from black to white. – I ran a scrap yard for 53 years, so I’ve always been out and about a lot. And often it happened that kids called out ‘Mum, mum! It’s Father Christmas’. The mums tended to be embarrassed but I’ve always said it’s fine. So when I retired it was obvious what I should do instead. The Edible Country is a do-it-yourself gourmet restaurant where visitors forage and cook their own food at one of seven tables placed in the Swedish wilderness. Each table comes with recipes composed by four Swedish Michelin-starred chefs and made of ingredients you can find in our forests, fields or lakes. Reserve your place at the table in VĂ¤rmland and enjoy the beautiful surroundings of the KittelfĂ¤ltet nature reserve, just a 40 minute drive from Karlstad. bookatable.com, visitsweden.com Seven handmade, wooden tables and cooking kits are placed around the country by Visit Sweden and the regional tourism board. They can be booked on bookatable.com or visitsweden.com from May until September. Together with your booking you will receive a recipe and a cooking-kit to be able to cook a menu with ingredient from our forests, fields and lakes. BRANÄS – PARADISE FOR FAMILIES Branäs is probably not for the extreme-skier who puts black slopes at the top of the wish list. But it has plenty to offer because everything is family-friendly, both on-piste and off-piste in the cross-country tracks. Children under the age of eight skis for free, and all activities are included. It is no wonder that Branäs has been awarded Sweden’s Best Family Ski Resort twelve times. There are 30 amazing downhill runs, thirty kilometres of cross-country tracks, 27 cabin areas and lots of fun activities to be found. Did You Know? Sweden’s first Ski Cross World Cup event took place i Branäs 2009. Learn more: branas.se SNOW-SAFE HOVFJÄLLET About 17 kilometres north of Torsby, Hovfjället proudly stands 542 meters above sea level. The resort has just over a dozen snow safe slopes, cross-country trails and ski schools all catering for a fantastic family holiday. The resort is located in a beautiful nature reserve and is both a popular summer and winter destination. For a number of years, you have also been able to book accommodation in one of the 19 cabins at the top of the mountain. You can’t get any closer to nature and the lifts than that. Did You Know? Branäs was named Sweden’s Best Ski Resort 2014 by the website turistmål.se Learn more: hovfjallet.se 44. Car Rallies Värmland has plenty of high speed car rallies during the summer and winter. Rally Sweden, Sweden’s largest rally race, is held in Karlstad and Värmland’s northern forests in February. The Rallycross World Cup (World RX of Sweden) is held in Höljes on July 5–7. The Gelleråsen Arena in Karlskoga holds plenty of exciting races all summer long. good food and swedish fika, outdoor life and many exciting events. A favourite among many locals and tourists alike! Visit our museums, walk in the city core, paddling, hiking, cykling, ﬁshing, explore minerals or just be. f you have ever gone through the main entrance to Stockholm Central Station or taken a bus from Gothenburg bus station, you’ve come across “the wermlander” Nils Ericsson. There is a statue of him outside the Central Station and the bus station is named after him. role in the American Civil War. Perhaps his biggest distinction is as inventor of the propeller. When the American screw-propelled steam-frigate Princeton used John Ericson’s propellers in a competition against a steamer, the propeller was heralded the world over. There is a statue of John Ericsson in New York, and there is a monument in his honour in Philadelphia. THE ERICSSON BROTHERS have been of considerable significance for Filipstad, Värmland and Sweden. Each year a scholarship is awarded in the brothers’ name by Filipstad municipality, and each summer a reconstruction of the Battle of Hampton Roads is performed in Filipstad, where spectators can, amongst other things, watch as boats fire canons at each other. This is just one of the many ways in which they are honoured in their home region. Spend time in Karlstad The city by the big lake - Vänern. A city that’s not too big and not too small and where the people are friendly and helpful. The place where the sun always shines. Or “Sola” as we should call genial inn hostess Eva-Lisa Holtz who spread joy and happiness back in the 18th Century. Karlstad can certainly merit various different descriptions but the simplest would be to describe it as a place where people feel good and feel at home. A warm welcome! It can sound clichéd to say everything is within easy reach. But that is the honest truth in Karlstad. There are 11 hotels within a 14-minute walk of the railway station. And some are even within a short three minute walk. You’ll be surprised by both local and international artists and photographers in delightfully creative symbiosis. Calling Värmland an important node on the Swedish culture map is by no means an understatement. Both new and old sit side by side here. After checking into your hotel, you’ll find most things to discover in Karlstad are within strolling distance. You will also be amazed at how beautiful the city is. The Klarälven delta where the river runs into Lake Vänern means you are almost always surrounded by water and places to swim right in the city centre. Geographically, Karlstad is in the centre of a triangle between three big cities. It is 220km from Oslo, 250km from Gothenburg and 300km from Stockholm. Getting here couldn’t be easier. Sandgrund Lars Lerin Artist and author Lars Lerin is considered to be one of the most prominent watercolour artists in the Nordic countries. He exhibits his works in his own art gallery in Sandgrund, a former dance hall. Wermland Opera Experience opera and musicals of high artistic quality in one of Sweden’s six opera houses that has hosted everything from Wagner’s Ring Cycle to Shrek the Musical. Värmlands Museum This is one of the most popular regional museums in Sweden that hosts international exhibitions and tells the story of Värmland cultural history. Artscape In 2017, a street art festival was arranged in Värmland consisting of large scale murals on building façades. You can see 7 of the 25 artworks here in Karlstad. The artists came from Portugal, Australia, Argentina, Sweden and elsewhere. Mariebergsskogen Beautiful Mariebergsskogen, Karlstad City Park, is very popular among families with children. You can pet animals in Lillskogen, take a ride on the Conrad Höök train, swim, play miniature golf and have a coffee break. In Karlstad, you can have a comfortable stay and eat well and also enjoy delightful outings in the local countryside. On Västra Långholmen and Segerstadshalvön peninsula, there are disability friendly walking trails so you can also discover the beautiful nature if you are a wheelchair user or pushing a pram or buggie. If you fancy exploring the water close up, you can rent a kayak or canoe. A shorter trip on the Klarälven river or a more adventurous outing in Lake Vänern, the choice is yours. Skutberget, I2-skogen and Sörmon are ideal for a mountain bike outing, and only 20 minutes away. Give your taste buds a real treat Along Klarälven, in the inner harbour or on Drottninggatan in the city centre. You can eat really excellent food in several different places in Karlstad. In 2018, Almars Krog, Blå Kök & Bar, Br Olssons Elektriska and Olssons Bazar were all listed in the White Guide (the 2019 guide is published in March). Coffee has a special place in the heart of Karlstad and Värmland. It is home to Löfbergs, one of the largest coffee companies in Scandinavia and you can often inhale the aromas from its roastery pretty much anywhere in the city. Its café Rosteriet, is listed in the White Guide 2018, as are Artisan Bread, Swenströmskas Stenugnsbageri and Carli Choklad (the 2019 café guide is published in May). Karlstad Stadslopp. 10km run in central Karlstad with 5,000 entrants. Sola Springmeet, Norra fältet. Värmland’s largest vehicle show. Karlstad Grand Prix, Tingvalla IP. World class athletics. Putte i Parken, Norra fältet. Music festival with free entry. Baltic Sea Youth Games 2019. Large youth event with 13 sports. Gyllene Tider - Goodbye tour, Mariebergsskogen Athletics-SM 2019 Abundance - international dance festival. Dancers from round the world. Tjurruset. The muddiest run of the year.